These words are inscribed in massive letters on the white pyramid of the Ministry of Truth. This creed serves as an introduction to the idea of doublethink. By weakening the independence and strength of individuals’ minds and forcing them to live in a constant state of propaganda, the Party is able to force its subjects to accept anything it decrees, even if it is entirely illogical. As well as administering “truth,” the Ministry spreads a new language among the populace called Newspeak, in which, for example, “truth” is understood to mean statements like 2 + 2 = 5 when the situation warrants. 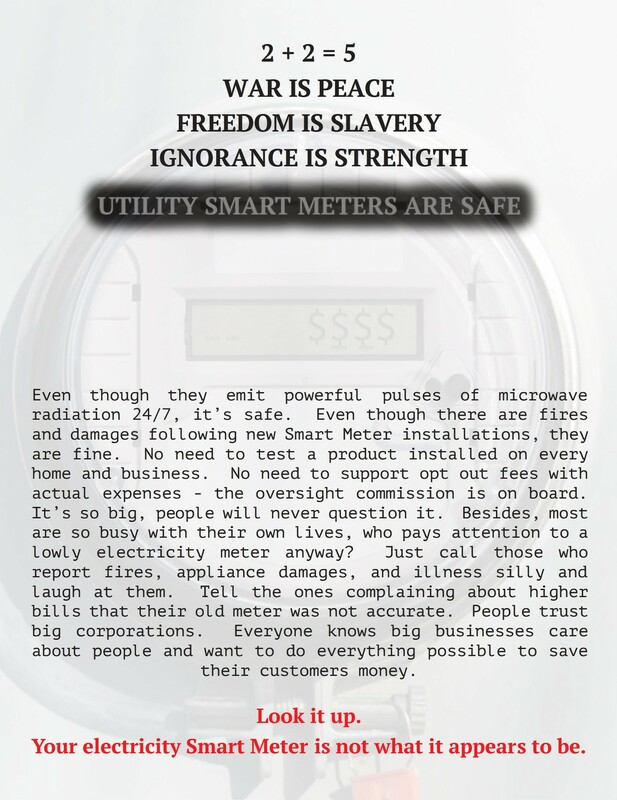 So yes, it does seem entirely likely that the smart grid industry and its advocates engage in a constant state of propaganda regarding so-called “smart” meters which are not smart, safe or green. Smart grid advocates talk about hypothetical benefits of smart meters such as “empowering” consumers when actually the “smart” meters are intended to the change of behavior of consumers making them more accepting of time-of-use rates and so that the utility can reduce costs and overhead. Smart grid advocates never talk about all the significant risks associated with smart metering technology and appear to simply ignore them. Smart Meters Increase the Risk of Fires! This entry was posted in Smart Grid, Smart Meters, and RF Emissions and tagged Big Brother, Propaganda, Smart Meters. Bookmark the permalink. What an interesting and “true” blog. Have a happy holiday. Thanks. Yes this article was intended as an appropriate one for the end-of-year holiday season where we can engage in a bit of satire about a serious subject.